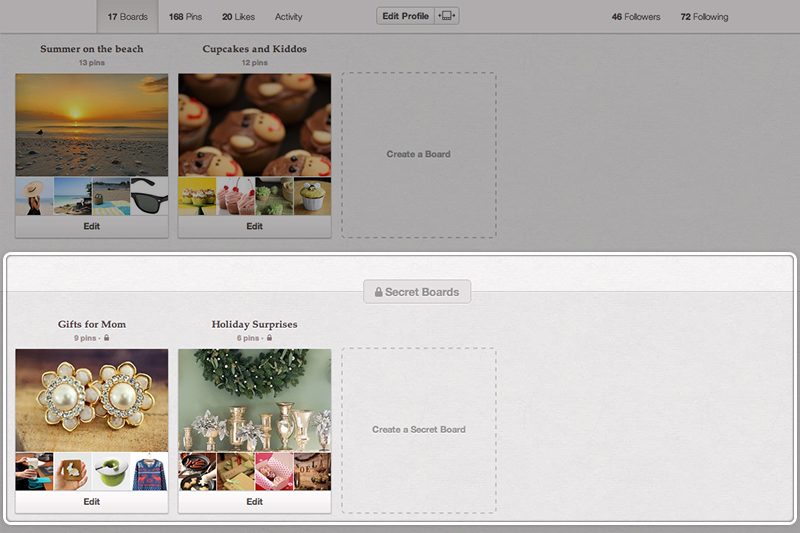 Pinterest has recently announced a new feature for the festive holiday season as a surprise to its members and it is known as "Secret Boards". These boards would enable you to keep your pins private.You may also invite other people on your secret board to add pins but the board and pins can only be seen the creators and pinners. This is an awesome way to create good surprises. How to create a secret board? 1- Log In to your profile page and scroll down to the bottom. 2- You will see a dotted area containing the words "create a secret board". 3- Click on it and start keeping your surprises. 1- You may not make your existing board a secret board. Only new boards created can go secret. 2- If you are using mobile then you need to download the latest version of Pinterest in order to use this feature. 3- This is just a test feature from the developers of Pinterest but if found popular then it can be made permanent.